When it comes time to purchase a new HVLP turbine spray gun, you might be confused a bit at all the options that are available. It can be difficult to determine how to make the best purchasing decision. That’s where this guide is going to come in handy! Once you’re done, you’ll be able to easily determine which is the best turbine paint sprayer for your needs. What Is A Turbine Spray Gun? A turbine spray gun is an independent system that uses a turbine to produce the volume of air needed to spray materials. The turbine is responsible for drawing the sufficient amount of air into the unit. This air then gets transferred to the hose for atomization. They are also relatively affordable compared to an HVLP spray gun and compressor unit. Because an HVLP turbine unit is self-contained, it offers maximum portability. You can take it anywhere that an electric outlet is available. When preparing to make your selection, there are some simple tips that will help you find the unit you are looking for. The first thing you must know is what an HVLP system is. It stands for High-Volume, Low-Pressure. Essentially, this means that you get a lot of materials coming out, but not a lot of air. This limits the amount of overspray you’ll experience as well as waste. Due to this, you are receiving a machine that will provide you the ultimate in efficiency. 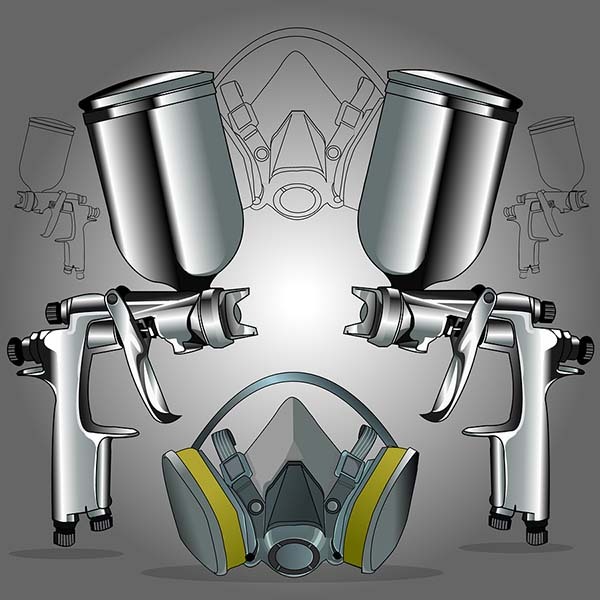 Airless paint sprayers are those that emit a lot of overspray. When a system refers to its stages, it is talking about the level of power. You’ll find products that have a single stage up to a five-stage in your higher end models. Stages will represent the number of fans within the unit and relate to overall power. The more fans you have, the more air gets pushed which creates the power. When deciding which is the right unit for you, you’ll want to consider the stages of the model. Every turbine paint sprayer will inform you of the viscosity levels that it can handle. This will be in relation to the thickness of materials you are looking to apply. For the lower power models, it might be necessary to dilute your thicker substances such as latex paints. With a higher powered model, you’ll have a better chance of being able to atomize more materials without dilution. You will be able to find lower range models for just around $100. These won’t be made of high-quality materials and generally features parts made of plastic. The lower price units will not stand up to continued use, so keep that in mind if you are working on a budget. If you are looking for something with maximum power and superior parts, you could be looking at prices over $1,000. Basically, there is a turbine spray gun available for all budgets. "What materials am I spraying?" "How often will I be using the unit?" By asking yourself these two questions and referring back to the information above, you should be able to determine what range of product you need. I’ve put together a list of some quality HVLP turbine systems I’ve come to love. Hopefully one of these will fit the criteria you need in a sprayer. The Fuji Mini-Mite 4 system has many of the same features found in the Mite 3 but offers a more powerful 4-stage motor turbine. It comes complete with the Fuji T-75G spray gun. This gun offers a pattern control knob to adjust the fan size anywhere from small to large. The gun offers a standard air cap set #3 (1.3mm) for general purpose fine finishing projects. This portable model is easy to transport and will develop approximately 8.5 PSI. You will have to do less thinning of materials than with a 3-stage model and it is enough pressure to spray most known coatings when properly thinned. Your set will also include the 600cc gravity nylon cup. This unit is perfect for both the professional painter as well as the beginner and everyone in between. There is also a noise reduction cover that houses the filters. In addition, you can expect to receive the viscosity cup, 25-foot Hi-Flex hose, cleaning brush, wrench and user manual. Finally, the heat dissipation box will remove any heat build-up from the turbine case. This Mini-mite Platinum is an awesome turbine spray system. Fuji products rarely disappoint and their turbine range is among the best sprayers on the market. Highly recommended! When you just have some minor household projects to complete, this lower range model might be right for you. It features a two-stage turbine that can spray thinned latex as well as lacquers and stains. It is a compact and lightweight model that is great for using in hard to reach areas. The professional grade metal cup that is included works great for fine finish applications. In addition, the variable flow trigger allows you to dial in the spray pattern width from 1 to 10-inches and anywhere in between. With the variable air pressure control, you will have less overspray even when using thin materials. The included 20-foot high-flex air hose will allow you to reach far to complete those tough jobs. Ideally, this unit is geared towards the occasional home user and not necessarily intended for professional painters. Despite being only a 2-stage turbine model, this sprayer is made of top-notch materials for the long haul. Ideal for the DIY user, this Fuji sprayer has professional features like the non-bleed spray gun and fan control knob for adjustable pattern sizes. It offers a 1400 watt 2-stage bypass motor housed in a metal turbine case. There is also a handy gun holder for easy access. This sprayer can handle most any coating and is designed with the serious user in mind. The Spray Station is a unique design geared toward the light contractor, automotive enthusiast or woodworking hobbyist. You can use it to spray cabinets, furniture, trim, doors and many other small to medium-sized jobs. It comes complete with a 650-watt turbine that can generate 42 CFM and 2.2 PSI. It also includes a 13-foot hose, 5.5-foot power cord, onboard storage for the pro spray gun and a carrying handle for portability. You’ll receive the 2.0mm stainless steel tip and needle plus a 1-quart PTFE coated paint container. What makes this unit different is instead of knobs for adjustment, you can use the fast “Push N Click” design to change your spray patterns. This unit is capable of spraying most materials including thinned latex, urethanes, oil, shellacs, stains, sealers, glazes, lacquers and enamels. When you want the top of the line, Fuji’s got you covered! This is the most powerful 5-stage turbine motor on the market and offering approximately 9.5 PSI. This allows you to apply your finishes faster and with less time. The heat dissipation box expels heat from the turbine so you have cooler operating temperatures. Less heat means a longer motor life. You’ll also receive a Fuji T-75G non-bleed spray gun that offers the pattern control knob. In addition, use the 600cc gravity cup for your materials and the standard air cap set #3 (1.3mm) for fine finishing projects. This unit can spray most lacquers, polyurethanes, water-based coatings, enamels and latex with ease. It is simple to maintain and ideal for the beginner and professional alike. Your kit comes complete with a 25-foot hose featuring quick connect, an air control valve, user manual, viscosity cup, cleaning brush, wrench and 5-for-5 bonus kit with 6-foot whip hose, wet film gauge, 19-piece spray gun cleaning kit and extra turbine filter. You may never need to buy another sprayer again! Purchasing your next HVLP turbine spray gun is going to be a personal decision based on your needs. Only you will know what is best for the projects you have in mind. Be sure you follow the buying guide that has been laid out for you and check first to see if one of the highly rated models I reviewed might work for your needs. Then, get spraying! Will compressed air-based HVLP guns work with turbine system as the air source? Just curious. I like the idea of having different guns for primer and finish.